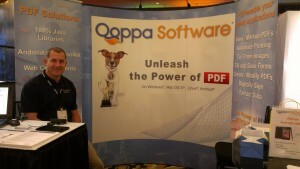 Qoppa Software President, Gerald Holmann and Marketing Director, Susan Sims, are currently at JavaOne 2012, meeting and talking with java developers, integrators, and device manufacturers about Qoppa’s line of PDF library products for Java and Android. 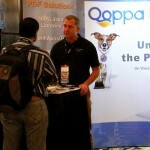 Qoppa’s booth (#5506) at JavaOne offers live demonstrations of the PDF rendering and manipulation capabilities it delivers in its Java PDF library products, PDF visual components, Android PDF toolkit, PDF desktop application and PDF workflow server. Java developers are able to directly discuss potential development and deployment scenarios with Gerald Holmann, president and founder of Qoppa Software. In addition to learning about our products, visitors to Qoppa’s booth will be entered to win a Nexus7 Android tablet (8Gb). Chances are excellent, much higher than winning the lottery, so make sure to stop by! “Friends of Qoppa” (existing and potential customers and partners) may claim a free Discover Passes to JavaOne, Oracle OpenWorld, and Oracle PartnerNetwork Exchange by emailing us. Now that we are home from JavaOne 2012, Gerald and Susan want to thank each of our customers and our many new friends for visiting with us at our booth. Congratulations to our prize drawing winner – Dr. Barry Burd of Drew University! 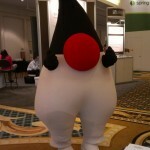 This entry was posted in Java PDF Library, Qoppa Software Events and tagged Android libraries, Events, Java Libraries, JavaOne, PDF Components, PDF Libraries on October 2, 2012 by qoppacom.